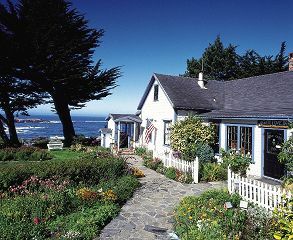 Perched on a bluff above the Pacific Ocean, Agate Cove Inn delivers a breathtaking view of the joining of land and sea. The Farmhouse and cottages are set on two acres of beautiful coastal gardens, and 100-year-old cypress trees frame the property. The main farmhouse was built in 1860 by Mathias Brinzing, who went on to establish the first Mendocino brewery. The property was also home to an apple orchard, and several trees still produce fruit. Operating for the past several decades as an inn, Agate Cove has provided unforgettable experiences to its guests as the perfect setting for weddings, anniversary and birthday celebrations, or just a relaxing getaway. Rooms feature ocean and/or garden views, most with fireplaces and decks. All have private baths, some with Jacuzzi tubs, soaking tubs, or showers for two. 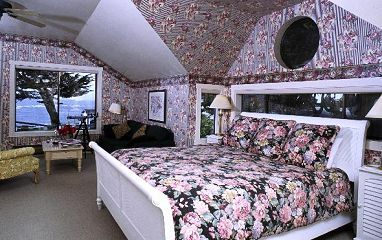 Each room is individually decorated, and luscious Scandia Down comforters adorn the king or queen-size beds. All rooms have a TV/VCR and CD player, and a variety of tapes and CD's are available for your enjoyment. Guests begin their morning with a newspaper delivered to their room. Rounding out the guest's experience is a full country breakfast, served in the Farmhouse breakfast room with its breathtaking ocean views. Breakfast begins with juice, and fresh-baked scones, muffins, or our award-winning bread. Entrees are cooked to order, oftentimes on our 100-year-old Belleville wood stove. Selections include Eggs Benedict, Omelettes, Frittata, or French Toast, and are accompanied by baked apples, poached pears, or homemade applesauce. Agate Cove is less than a half mile from the center of Mendocino village, which boasts numerous fine galleries, specialty stores, and restaurants. The area also hosts several State parks, as well as the Botanical Gardens and rhododendron reserve. Anderson Valley, home of many award-winning wineries, is only a short drive away.